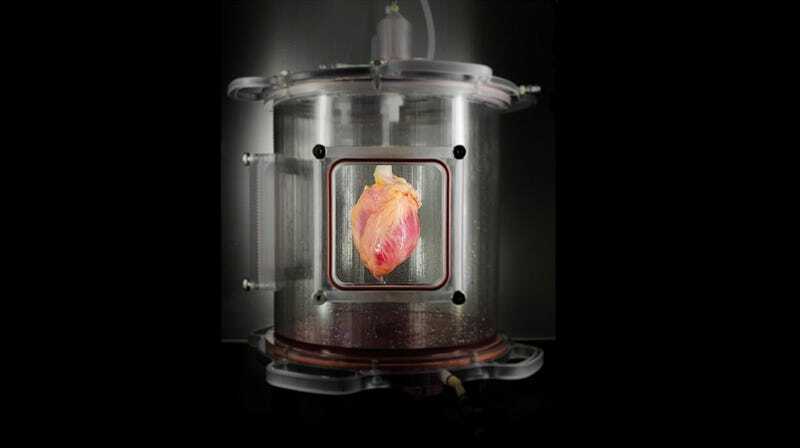 What looks like a prop from a steampunk movie is actually a partially decellularized heart in a bioreactor. And this heart has the potential to save the lives of heart attack patients, and, one day, people who need heart transplants too. In a new paper in Circulation Research, scientists at Massachusetts General Hospital describe a process that was first tested on rat hearts and those of large mammals, and is now being applied to human organs. The process involves stripping away the muscle cells in the heart, leaving the rest of the structures intact, and then rebuilding the heart with new muscle cells. That sounds redundant, but it could provide people with “patches” that replace damaged tissue, and save heart transplant patients from rejecting their new organs. The process starts with hearts from organ donors. A special detergent strips away the muscle cells, but leaves the proteins and blood vessels. This decellularization gets rid of not just muscle cells, but also of human leukocyte antigens (HLAs). HLAs are the proteins that the body uses to know which cells to sic the immune system on. They’re passed down from parents to children, which is why siblings are the best possible donors for patients in need of kidneys or livers. The wrong HLA markers will cause a patient to reject organs. Stripping the HLAs will help transplant patients accept foreign tissue. But before that happens, the team has to rebuild the tissue. They started with pluripotent stem cells, which they induced into forming cardiac muscle cells. The cardiac cells were grown in a tissue culture for several days, and then injected into the decellularized hearts. The hearts were put in a bioreactor—a device that supplies nutrients to the cells and sometimes gently moves the organs to encourage cell growth. After two weeks, the team found cardiac cells that, through immature, could contract like regular cardiac muscle tissue. Recreating an entire human heart is still a few years away. The immediate next step are “myocardial patches” that will allow people who have suffered heart attacks to replaced badly damaged muscle tissue—without worrying about rejection.